August 20, 2015 /Photography News/ A family beach outing turned terrifying last week when what was thought to be a washed-up buoy turned out to be an active bomb. 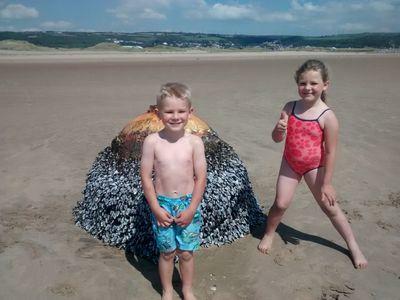 Kelly Gravell of Burry Port, Wales, said she and her family were on the beach August 12 to picnic when theirt two children saw something washed up on the sand as they took their boogie boards down to the water. The item was large and almost completely covered in barnacles. The family thought it was a washed-up buoy. The object intrigued her, her husband, and their two children, Erin, 6, and Ellis, 4. The children posed for pictures with the object and the family posted the pictures on social media. They finished up their beach day and went home. Five days later, Pembrey Country Park officials announced on their Facebook page that the “buoy” discovered on the seashore was a United States military mine bomb. The object reportedly dates back to World War II. Gravell said she and her husband, Gareth, were notified of the news by a friend who saw photos of their children with the bomb on Facebook. "The realization that it was a bomb -- it was completely shocking for us," she said. "We realize now just how lucky we were." 18 comments so far. What do you think?